(This blog first appeared on Share My Lesson). Has anyone else been having trouble sleeping since the school shooting in Florida? Every single life lost before its time is a tragedy. For many of us, this one feels… different. Perhaps it’s the fact that we had three mass shootings so close together. Or that it was in a school, again. Many of us may even feel numb—and then feel a bit nervous about what that feeling means. The amount of bad news all around us today is overwhelming and can easily lead to fatigue. Educators can seem powerless in the face of lobbyists and well-financed special interests. We must remind ourselves that there are powerful and simple things we can do to make a huge difference. Aside from marching and calling Congress to demand action—which I highly recommend—here are some non-controversial steps we can take in our roles as educators. Did you know that the simple acts of smiling more often and seating students closer to your desk have been proven to make a big difference for students who are struggling? Nearly all of the recent shooters felt like outsiders. Adolescence is rough, even for students who have loving homes. Educators know that we need to foster relationships with students, but sometimes we don’t know exactly how to do it. If you want to see specific actions you can take to build relationships with your students, see my resource on fostering relationships. Focus on those students who may particularly need a strong, positive adult in their lives. And did you see this incredible excerpt in Reader’s Digest about a teacher? Every Friday afternoon, she asks her students to take out a piece of paper and write down the names of four children with whom they’d like to sit the following week. … She also asks the students to nominate one student who they believe has been an exceptional classroom citizen that week. All ballots are privately submitted to her. … I stared at her with my mouth hanging open. “How long have you been using this system?” I said. What an amazing teacher and idea! We can also do more to make our learning environment fun and enjoyable. Laugher and joy release feel-good hormones in the brain. See my resource for building a joyful learning environment for concrete steps you can consider incorporating in your teaching practice. 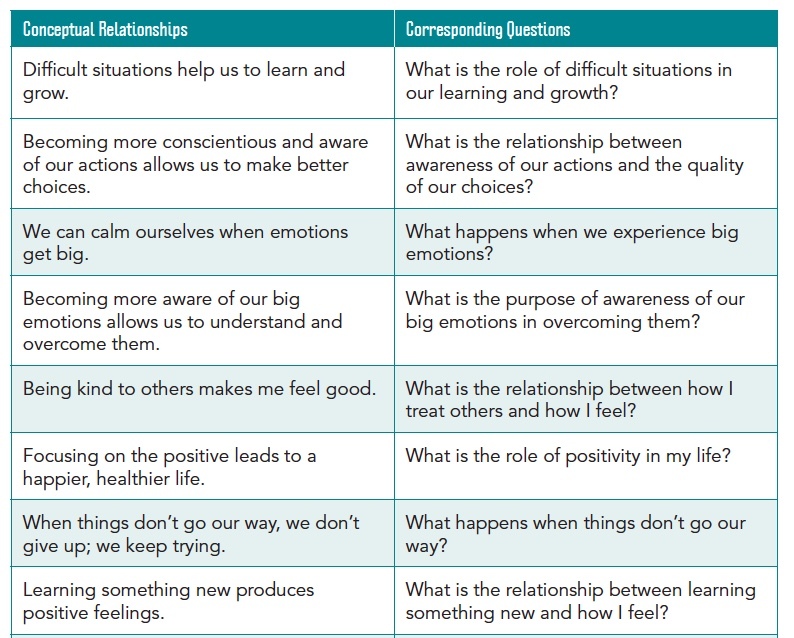 What do I do to create an emotionally supportive learning environment? What do I do to exhibit a growth mindset about each of my students? What do I do to create an engaging classroom? What do I do to create a physical environment that stimulates learning? Check out this self-assessment that helps teachers reflect on their practice in each of these categories. Have you seen the incredible resources in Share My Lesson’s collection of social-emotional learning lessons? H. Lynn Erickson realized decades ago that big ideas are created with two or more concepts stated in relationship with a strong verb (Erickson, Lanning and French, 2017). Erickson’s beautifully simple formula is supported by decades of sound research. For example, the authors of the revised Bloom’s Taxonomy wrote, “In the revised Taxonomy, we wanted to distinguish knowledge of discrete, isolated content elements (i.e. terms and facts) from larger, more organized bodies of knowledge (i.e. concepts, principles, models or theories)” (Anderson and Krathwohl, 2001, p. 42). This distinction is important because concepts transfer to new situations, while facts do not. This year, education researchers wrote, “Students move to deep learning when they plan, investigate, and elaborate on their conceptual understandings, and then begin to make generalizations” (Hattie, Fisher and Frey, 2017, p. 31). What is the purpose of emotional awareness? Students could read a book or short story or watch a video about someone recognizing when they are feeling angry and then pausing to take three deep breaths to calm themselves. Next, they could use their understanding of that conceptual relationship to study additional research on emotional awareness. They could then transfer their understanding to their own lives, and practice emotional awareness as a tool for calming themselves. If you like the notion of the “big idea” inquiry cycle, join me for a free webinar on Thursday, March 15, to learn more. Although our world has become increasingly complex over the years, and at times can feel a bit depressing, I have faith that the right kind of schooling can change society for the better, empowering young people to use what they are learning to tackle the world’s biggest challenges. Anderson, L. W. & Krathwohl, D. R. (2001). A taxonomy for learning, teaching, and assessing: A revision of Bloom’s taxonomy of educational objectives (abridged edition, 1st ed.). New York, NY: Pearson Education. Erickson, H. L., Lanning, L. A. & French, R. (2017). 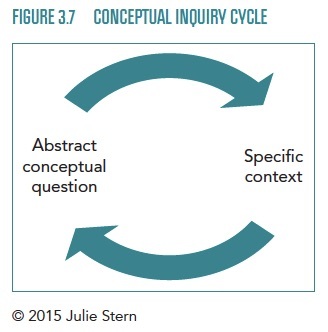 Concept-based curriculum and instruction for the thinking classroom (2nd edition). Thousand Oaks, CA: Corwin Press. Hattie, J., Fisher, D. & Frey, N. (2017). Visible learning for mathematics, grades K-12: What works best to optimize student learning, grades K-12. Thousand Oaks, CA: Corwin Press. Previous postWhat does #metoo mean for schools? Next postHow Do We Prepare Students for a Complex World?